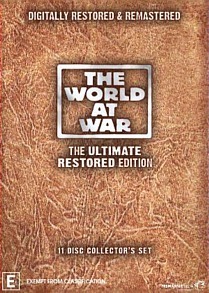 The World at War - The Ultimate Restored Edition DVD Review The World at War still stands as the most authoritative and exhaustively-researched television series to date on World War II, a distinction that has now remained unchallenged for the better part of four decades. Originally released in 1973, The World at War remains the definitive exploration of the war which claimed more than 60 million casualties, forever changing both the borders of Europe and the lives of the people dwelling within them. Comprising 26 hour-long episodes on all aspects of the hostilities that took place in Europe, Africa and across the Pacific, this landmark Thames Television series still remains the preeminent documentary series about World War II, offering unparalleled insights into the bloodiest conflict of human history and providing an all-encompassing overview of the war, including its genesis and aftermath. The rebirth of Germany and growth in power of the NAZI Party leading up to the outbreak of war. The invasions of Poland, the Winter War, the sinking of the Graf Spee, the "phony war" and failure in Norway and the elevation of Winston Churchill to Prime Minister. French politics, the Maginot Line, Blitzkrieg warfare, and the Nazi invasion of France and the Low Countries. The Battle of Britain, retreats in Greece, Crete and Tobruk, and life in Britain between the evacuation at Dunkirk and Operation Barbarossa. After dominating southeastern Europe through force or intrigue, Germany begins the massive invasion of Soviet Union. Despite several quick victories, the invasion ultimately stalls after a failed assault on Moscow during Russia's harsh winter. The rise of the Japanese Empire, the Sino-Japanese war, Pearl Harbor and the early Japanese successes, and the fall of Malaya and of Singapore. The opposition by various factions to the United States of America entry into the war, U-boat attacks on Atlantic convoys and America's gradiated responses, the mobilization of America after Pearl Harbor, the loss of the Philippines, the Doolittle Raid, Midway and Guadalcanal. The desert war, starting with Italy's unsuccessful invasion of Egypt and the successive attacks and counter-attacks between Germany and Commonwealth forces, and the Afrika Korps' eventual defeat at El Alamein. The mid-war German situation in Southern Russia resulting in the Battle of Stalingrad – and its ultimate German catastrophe. The submarine war emphasizing mainly the North Atlantic. Tracks the development of both the convoy system and German submarine strategy. Interviewees include Grand Admiral Karl Dönitz and Otto Kretschmer. The rise of the Red Army, mobilisation of Soviet production, the siege of Leningrad, the Soviet partisans and the Battle of Kursk. The development of British and American strategic bombing in both success and setback. Emphasizes the difficult Italian Campaign beginning with Operation Torch in North Africa, the invasion of Sicily; Salerno, Anzio, Cassino; and the capture of Rome. The jungle war in Burma and India - what it "lacked in scale was made up in savagery". 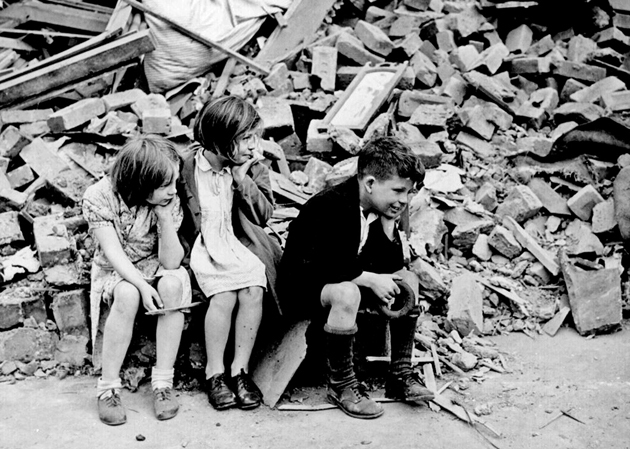 Life and politics in Britain from post-Battle of Britain to the first V-1 attacks. An exploration of German society and daily life, and how it changed as the fortunes of war were reversed. Censorship and popular entertainment, the transformation of German industry, the recruitment of female and foreign labour, allied bombing, German dissent - including the 20 July plot, and the mobilisation of the Volkssturm towards the war's end. Interviewees include Albert Speer, Otto John, Traudl Junge, Richard Schulze-Kossens, and Otto Ernst Remer. The development and execution of Operation Overlord followed by the allied breakout and battles at Bocage, and Falaise. Emphasizes life in the Netherlands with German occupation, when citizens chose to resist, collaborate or remain passive. The allied breakout in France and the failure of Operation Market Garden, the Warsaw Uprising, the Battle of the Bulge, and the crossing of the Rhine. The final invasion of Germany by both the Western and Eastern allies, the bombing of Dresden, and the events in the Führerbunker. Interviewees include Albert Speer, Traudl Junge and Heinz Linge. Japan's society and culture during wartime, and how life is transformed as the country gradually becomes aware of increasingly catastrophic setbacks including the Doolittle raid, defeat at Midway, the death of Isoroku Yamamoto, the Battle of Saipan, Okinawa and the relentless bombing of Japanese cities. The successive and increasingly bloody land battles on tiny islands in the expansive Pacific, aimed towards the Japanese heartland. Following the bombing of Darwin, the over-extended Japanese are progressively turned back at Kokoda, Tarawa, Peleliu, the Philippines, Iwo Jima and finally Okinawa. The development of the atomic bomb, the ascendency of President Harry Truman, emerging splits in the Allies with Joseph Stalin, and the atomic bombings of Hiroshima and Nagasaki, ultimately leading to the surrender of Japan. Interviewees include Toshikazu Kase, Yoshio Kodama, Marquis Koichi Kido, Major General Charles Sweeney, Brigadier General Paul Tibbets, Alger Hiss, W. Averell Harriman, Lord Avon, McGeorge Bundy, John J. McCloy, General Curtis LeMay and Hisatsune Sakomizu. The situation in post-war Europe including the allied occupation of Germany, demobilisation, the Nuremberg Trials and the genesis of the Cold War. 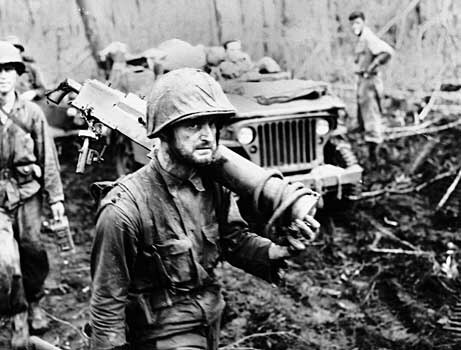 The episode concludes with summations about the ultimate costs and consequences of the war. How the war was experienced and remembered by its witnesses. The new anamorphically enhanced widescreen transfer is pretty close to faultless, especially considering the age of some of the material. Maps, graphics and interview footage are devoid of any grain or artefacts, and the period footage has been expertly sourced and rendered as cleanly and crisply as possible. The Ultimate Restored Edition also features 2.0 and 5.1 surround audio options; both are respectable, though the 5.1 is naturally the more balanced and resonant of the two. All content on all 11 discs has been remastered and restored, and the series itself and the bonus features alike boast 5.1 surround sound and English subtitles for the hearing impaired. Included among the 3 discs of bonus material are a number of documentaries and extended featurettes, including a contemporary Making Of filmed shortly after the series was first broadcast, a 2-hour extended retrospective incorporating interviews with the makers of the original program and a comprehensive exploration of the entire restoration process from start to finish. Of particular note amongst the original content are an extended interview with Hitler’s secretary Traudl Junge, a harrowing 2-part documentary on the Final Solution which comprises the entirety of Disc 10, movie-length features on daily life in Hitler’s Germany both during the pre-war years 1933-1938 and from 1939-1945, and a featurette simply entitled ‘Warrior’ which explores the deadly, distinctly unglamorous realities of warfare through archival footage, eyewitness accounts and interviews with survivors of the front lines. Also included are biographies of some of the key lives of the period, a brief written history of The World at War, episode summaries, speeches and songs, interviews with eminent historians and scholars such as Stephen Ambrose, newsreels, maps and an Imperial War Museum photo gallery. Well worth its $89.95 RRP and an indispensible resource for dabblers and devotees alike, The World at War still stands as the most authoritative and exhaustively-researched television series to date on World War II, a distinction that has now remained unchallenged for the better part of four decades. The packing and presentation are first-rate, the bonus features enthralling and the series itself largely unparalleled - for armchair military historians it really doesn’t come much better than this.